Curran was in prolific form for Waterford this afternoon. 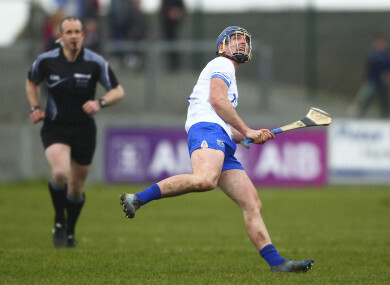 PATRICK CURRAN SHOT 1-13 as Waterford recorded their first victory at Walsh Park in over two years — but a second league success wasn’t enough to avoid a relegation play-off against Cork next weekend. Prompted by Curran and Austin Gleeson, the Déise staged a first-half recovery from six in arrears and never looked back.Michael Kearney also impressed for a revamped home side with four points from play. After back to back losses, Clare can plan for a league quarter final against Limerick. Against the breeze, the away team raced 1-8 to 0-5 ahead inside the first quarter. Eight players were on target for the Banner. On 17 minutes, John Conlon pounced on a stray pass from Kevin Moran. Ian Galvin put Conor McGrath through one on one and fired past Ian O’Regan. Austin Gleeson ignited Waterford fightback from number six. The Déise hit seven points on the bounce (five courtesy of Patrick Curran) to earn a 0-12 to 1-8 advantage after 31 minutes. David Reidy levelled matters. Two minutes before the break, Curran whipped to the net after Conor Cleary hooked Stephen Bennett’s initial strike at goal. The Dungarvan man finished the half with 1-7. A Gleeson point in added time sent Derek McGrath’s men 1-13 to 1-10 clear. Two Tony Kelly efforts restored parity nine minutes into the second period. Curran and Kearney edged the hosts back in front. Peter Duggan and John Conlon promptly levelled it up again at 1-15 apiece. Three Curran frees gave the hosts a four point cushion entering the last ten minutes. Kearney added two more. Kelly’s fourth of the afternoon closed the gap to two. Conor Gleeson was dismissed on a second yellow before Curran completed his massive haul three minutes into injury time. The Déise snuffed out Duggan’s late free. Scorers for Waterford: Patrick Curran 1-13 (9fs), Michael Kearney 0-4, Stephen Bennett 0-2, Kieran Bennett, Conor Gleeson, Austin Gleeson, Kevin Moran 0-1 each. Scorers for Clare: Peter Duggan 0-5 (4fs), Conor McGrath 1-1, Tony Kelly 0-4, David Reidy 0-3, Ian Galvin, John Conlon 0-2 each, Seadna Morey, Cathal Malone, Shane O’Donnell 0-1 each. Email “Curran-inspired win over Clare not enough for Waterford to avoid relegation play-off”. Feedback on “Curran-inspired win over Clare not enough for Waterford to avoid relegation play-off”.